In this, Nancy's third collection of short fiction, she creates contemporary fables and transformation stories largely inspired by titles and themes belonging to Native Americans, particularly Alaska's Athabaskans. A number of the stories first appeared in literary journals and one ("Candace Counts Coup") received a Pushcart Prize. Nancy describes the stories as "playing spirited riffs on some of the old wisdom from Native American and frontier mythologies to show us ourselves dreaming, making do, and getting by in the modern world." She has also said, "It was not my intent to appropriate, retell, or improve on the traditional source stories, but to use them as starting points to explore the dilemmas and delights of contemporary American life." As Joseph Campbell wrote, "The main motifs of the myths are the same, and they have always been the same." "These fresh, startling, wonderful stories deserve a wide readership. I gobbled them up." "Alaskan transplant Nancy Lord puts a contemporary spin on indigenous Alaskan folktales in The Man Who Swam with Beavers, and the results are often delightful . . . In the utterly charming title piece, a man leaves behind his job and family to take up residence with a clan of the furry, friendly dam builders." "There's something for every taste in this eclectic collection of short stories inspired by Native Alaskan myths and legends . . . In many of these 17 pieces, ranging from poignant and fanciful to depressing or bizarre, animals figure as prominently as people. 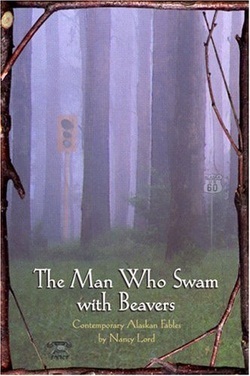 A retired orthopedic surgeon becomes interested in birds, a wolf-dog can't escape his wildness and lives in both worlds, a woman's wedding to a bear is thwarted because the bear fears excessive civilization, a teenage boy explains his two lesbian mothers, and a ninth-grader tries to adjust to her mother's death from cancer. Readers interested in Alaska or in the contemporary use of folk and fairytales will enjoy this collection. Recommended."